With reports of higher than normal spring-germinating wild-oats showing up in wheat, growers are being advised to plan which fields would warrant a herbicide application later on this spring, according to Dr. David Stormonth, Technical Manager for Interfarm UK Ltd.
“ADAS are reporting greater numbers of wild-oats appearing in wheat this year. With the economic threshold being just 1 plant every 2 square metres, growers should be prepared to apply a post-emergence herbicide once weed emergence is complete. Emergence this spring started around the end of February and most wild-oats are currently around the 1 leaf stage. There is still time to wait for the rest to emerge before applying a contact herbicide, but don’t wait until the crop canopy closes over and makes coverage difficult. A foliar-acting herbicide based on the active ingredient fenoxaprop-p, Warrant is recognised as being a very effective post-emergence grass-weed herbicide, particularly on wild-oats,” explains David. “Warrant contains 83 g/l of fenoxaprop-p and the dose rate varies according to weed size. It is recommended at a dose rate of 0.33 l/ha plus an appropriate adjuvant for wild-oats up to Growth Stage 23, or 0.5 l/ha plus adjuvant for wild-oats up to Growth Stage 30, or 0.66 l/ha plus adjuvant for weeds up to GS 39,” advises Dr. Stormonth. As well as wild-oats, Warrant has good activity on rough-meadow-grass and awned canary grass from two leaves up to Growth Stage 31 of the weed. “It can also be mixed with many broad-leaved weed herbicides to tidy up on weed control. Warrant has excellent crop safety and no LERAP,” reminds David. He warns growers not to overlook wild-oats as they are the most competitive annual grass-weed in cereals. “This is because they have a very similar growth habit to cereals, yet can grow even larger, sucking up valuable moisture and nutrients as well as literally shading the crop. 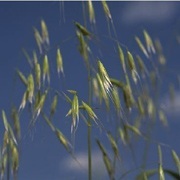 Wild-oats also contaminate grain and are costly to remove. They can act as hosts for some damaging viruses, insect pests and nematodes. Do not ignore wild-oats, especially in such as season as this when wheat prices are good and many crops look to have good yield potential,” says Dr. David Stormonth.